Families come in all different shapes and sizes - and this particular family has LOTS of shapes and sizes included! ... and they also have a crazy fun family! Swarley and Bing have lots of furry siblings, like their dog brother Biscuit, whom they absolutely adore. "Every day when I go to say hi to the prairie dogs, if Biscuit walks in they will run over and greet him before me," the family's mom, Cassidy, told The Dodo. And a goat, of course. 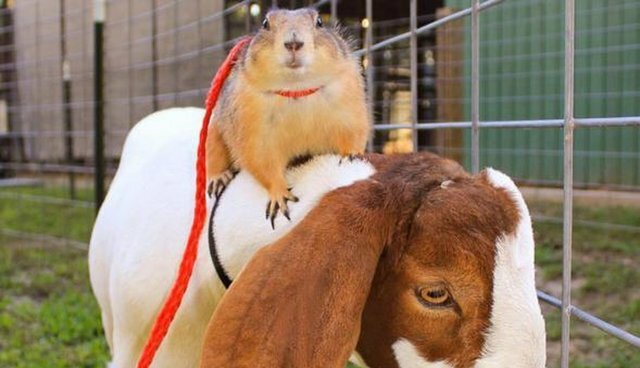 "The prairie dogs get along with the goat very well. Bing will sit on his back for a long time just enjoying the view," Cassidy said. The shenanigans that this family get into are limitless, and they love doing pretty much everything together. And just being generally fabulous. This big, cuddling family seems like they would probably be pretty lost without each other, which is great, because we would totally be lost without all these precious pictures of them together. Never stop being you, guys. The pictures of your family just doing your thang are too stinking cute.